Travel, for a pilgrim on the road to the examined life, can be as important as the books you’ll read. For some, travel trumps everything. I understand that, and for many years practiced it accordingly. My daughter, Allie, a kindred spirit, lived in Peru for six months in 2006. At the end of her job there I flew down to visit and travel with her. I hired a guide and we made the pilgrimage through the Sacred Valley, stopped in Cusco, then took the train to Rio Urubamba, the village at the foot of Machu Picchu. I thought you might be interested in this little vignette from that adventure. I found it in a journal of that period, a recovered memory. The bus back to Rio Urubamba from the summit of Machu Picchu carries about thirty people. It is a precipitous journey from the summit. The road switches back along the dusty 8km route maybe 15 times, plunging here, leveling there before dropping again. The trip down takes approximately thirty minutes. 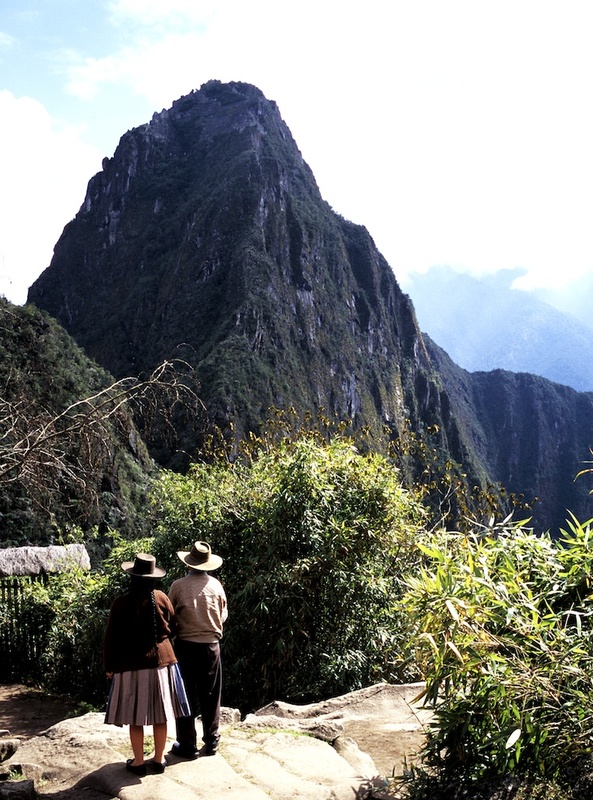 the tour and Allie´s summit of Huayna Picchu, we took the bus down the mountain. I looked over my shoulder at the receding ruin and could not help but think that I would never see it again. Dark mood. At the first switchback a group of young boys waved at the bus and hollered. We waved from our seats. They were dressed in bright orange capes, traditional-looking outfits, and shook their arms in the air. They were animated. The bus trudged on leaving them in a cloud of dust. They closed their eyes and covered their mouths. At the next switchback one of the boys reappeared, again shouting and waving his arms. I thought it curious. The bus continued down the mountain. Then again he materialized, seven or eight minutes later at the next switchback–and again, appearing out of the forest, waving, shouting, then rushing downhill into the jungle, an orange blur. After maybe a dozen turns and untold vertical feet we came upon the bridge across the Urubamba. He darted out from the left racing against our flank and rushed in front of the bus, charging across the single-lane wooden bridge, arm extended as the bus roared on. Alas, on the other side, the driver stopped, the young boy jumped aboard, not even breathing hard, and shouted into the bus. He extended his purse. We bus passengers, amazed at his feat of running down the mountain, chasing and beating the bus, dug into our pockets and dropped our coins into his hand. I held out a candy as well. He looked at me and smiled. His eyes were big and brown and he snatched the candy and moved past us down the aisle. He sang goodbye and disappeared into the crowd at the station to a round of cheers and applause. This is the stuff of travel, I thought. Follow me on Twitter…or not. What I’ve been reading lately.